In 10-inch nonstick skillet, melt butter over medium-high heat. Add chicken; cook 5 to 8 minutes, turning once, until chicken is browned on both sides. Add apple juice. Reduce heat to medium; cover and cook 5 minutes. Add carrots; cover and cook 5 to 10 minutes or until juice of chicken is clear when center of thickest part is cut (170°F) and carrots are crisp-tender. With slotted spoon, remove chicken and carrots from skillet; place on serving platter and cover to keep warm. Stir mustard into liquid in skillet. 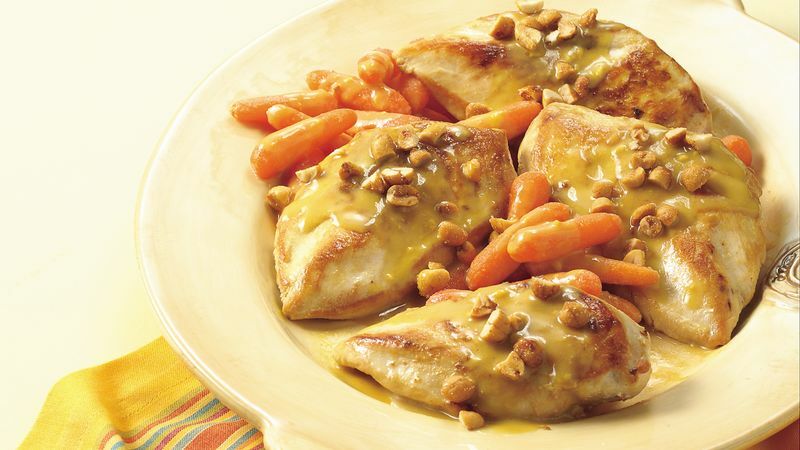 Spoon mustard sauce over chicken and carrots; sprinkle with peanuts. Most of the fat in peanuts is monounsaturated fat, which may help maintain heart health. Just watch portion sizes because peanuts are high in calories.